Is he a rapper or a hip-hopper? I don't know the difference, does anyone? whatever it was, we got it a-plenty. Audience participation is at the core of his performance. The room was randomly split into "Haves" and "Have nots" with the former chanting "Privatise the gains" and the latter "Socialise the losses" - perhaps a prequel to the Labour Party Conference! The music was from his last album, The Legend of Mike Smith, reviewed here by Russell, and successfully downsized to trio format albeit with the aid of some laptop sampling - if this had been a CIU club we'd have called them backing tracks! Based on the Seven Deadly Sins - the audience knew them all - the music varied from the wildest alto playing I've ever heard to some of the most sensitive. 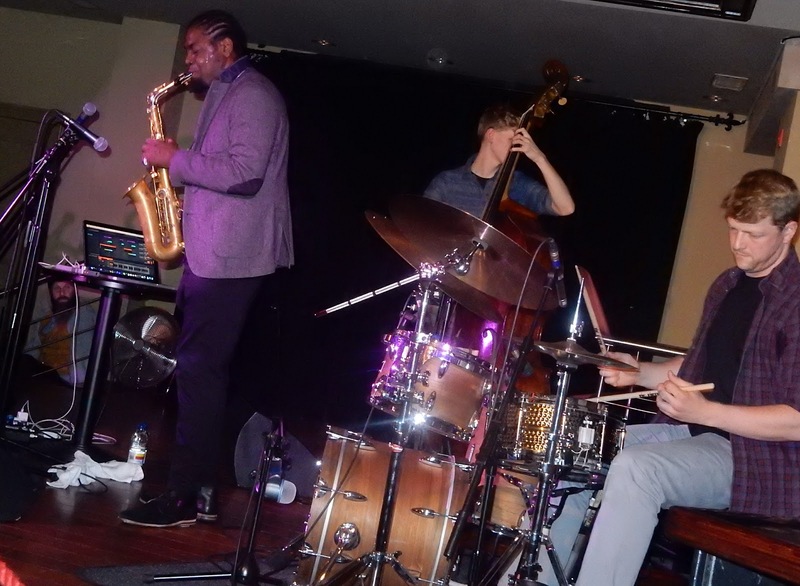 Jurd fluctuated between double bass and bass guitar soloing effectively whilst Silk, who is becoming something of a regular visitor to the area, also stamped his credentials on the proceedings with plenty of drive - powerful without being domineering. And, as if that wasn't enough, a cameo spot for Hannabiell on trombone gave us just that little bit extra. Truly a, in years to come, night to say proudly, "I was there"! Thanks Lance , it was JAZZ & HIP HOP , they ARE bedfellows ! Rappers are different from Hip Hop , rap is what you do, Hip Hop is what you live ! Rap is part of Hi Hop which includes DJ culture graffiti, break dancing & a musical attitudeb ! When I grow up I wanna be Lance ! !